The American Hybrid Technology Non-Signature phonostage ($5,750), brainchild of Dan Fanny, is a unit that Harry Pearson, Roman Zajcew and the late Ann Turner heaped countless kudos upon in the pages of The Abso!ute Sound (Issues 104 & 106). My initial reaction upon hearing this piece is that if you could die of sheer pleasure from listening to reproduced music, then this is the one unit that could do me in. For a while, my digital gear was coming pretty close to rivaling my analog stuffbut no more. The Non-Signature virtually pinned me to my listening seat with detail, imaging, dynamic capability and impact (especially in the bass) that was almost too much for my senses to cope with or absorb. Whew! Really, I never knew musical reproduction could be like this. The Non-Signature phonostage is the culmination of years of research and development in one designers personal crusade for perfection. Fannys unrelenting scrutiny of every element that goes into each and every unit goes a long way toward ensuring the overall sonic performance of each of his designs. To start with, the Non-Signature employs a dual-mono high-current power supply with multiple-stage voltage regulation. 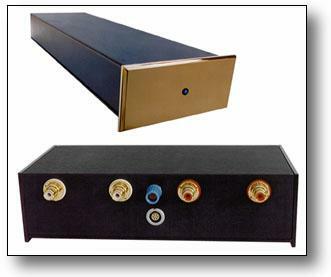 The twin toroidal transformers and regulator board are housed in a remote chassis (19"W x 6"D x 2"H) that is much larger and considerably more massive than the phono section it supplies. There is no power switch to corrupt current flow, and the entire phonostage is designed to remain powered up at all times. A heavy-duty power cord is included in the package, though an IEC receptacle allows you to incorporate the most exotic AC cord in your repertoire. There is a blue LED on the faceplate to indicate that AC is being received. Im told that this power supply is stout enough to operate a moderate-size power ampthe head unit its mated to will barely tax its capability. The compact dimensions of the phono section (8"W x 4"D x 2"H) will allow it to fit almost anywhere. Its packed to the gills with ultra-high-tolerance aerospace-grade components, including a composite woven Teflon circuit board with ground-plane shielding, to ensure stability and vanishingly low levels of noise. What really impressed me here were the lengths to which the designer went in the selection of the circuits component parts. The critical RIAA equalization stage uses custom-value Vishay resistors that have a tolerance rating of 0.005% (this is not a typo). Here, where competing high-end companies are spending about 25 cents a piece (OEM) for lower-grade Vishays, Fanny is paying a whopping $57 each for hermetically sealed laboratory-grade resistors. These do not become noisy or deviate in value from -55 degrees C to +150 degrees C. Many people dont realize that Vishay makes a very wide range of resistors that can cost as little as a few cents a piece or as much as hundreds of dollars each. Same story with capacitors. Here precision Component Research Teflon caps costing about $30.00 each are employed, while the best competing products use capacitors costing maybe $3 to $4 a pop. In fact, the Component Research capacitors are of such precision and stability that they are widely used in military and aerospace applications such as the F-15 and F-18 fighter planes; the Trident, Lance and Sparrow missiles; and the Space Shuttle. Many of the Non-Sigs internal components come to AHT with official military documentation, which guarantees very exacting performance characteristics. IC chips? Im glad you asked. The Non-Signature uses the same kind of military-spec chips that normally perform their function in satellite communications, each costing $37 (OEM) in bulk. Additionally, short lengths of pure linear-crystal silver wire connect the PC board to the highest-grade WBT RCA-type input and output jacks. The majority of manufacturers opt for the lower-grade WBTs because of the considerable expense in going to the high-grade connectors. But Fanny knows that his WBTs are 99.9% pure copper, hard plated with 24-karat gold, and that is that! As you would expect with electronics of this caliber, the Non-Signature boasts some very impressive specifications. Frequency response is from 1Hz to 60kHz plus or minus 0.05dB; THD is 0.0015%; signal-to-noise ratio is 90dB (A-weighted - 0.5 mV.) for MC and 98dB for MM cartridge. A maximum of 66dB of gain is available, so in many cases a high-quality passive preamp would be a viable option for those purists among you. My particular installation is made up of a Townshend Mk-III Rock turntable with a modified Rega RB-300 arm and Transfiguration MC cartridge. AC is provided to the turntable through a ByLux Dedicated Line Filter. The Non-Signature phonostage was inserted between the Townshend and an AHT line-level tube preamp via Nordost SPM Reference interconnects. Full Spectrum Audio Signature cables connected the line-level preamp to my AHT/Acoustat servo-charged monoblocks, into which my Acoustat III speakers were directly plugged. The Non-Signature is a class-A non-inverting unit that uses Vishay plug-in resistors to vary the gain (from 46dB to 66dB) and cartridge load (from 10 ohms to 47k ohms). The particular unit I auditioned was set up to provide 60dB of gain with a load of 100 ohms, which is a good value for my cartridge. Because my line-level preamp is direct-coupled, the DC offset of the Non-Signature phonostage must be nulled using adjustable controls located on the circuit board. These controls are accessible through the units bottom panel using the insulated screwdriver provided. After the unit has been powered up and stabilized (about 20 minutes) and with the turntable, arm and cartridge connected to the inputs of the AHT, you simply set the included meter for DC volts and plug its RCA-type male probe into one of the outputs. You then insert the screwdriver (it takes a little patience to locate the slotbe gentle) and adjust the corresponding pot until it reads "000" in its most sensitive position. Copy this procedure for the other channel, then repeat the measurement for both channels and readjust as necessary. You are now ready to flip the unit over and connect the outputs to your linestage (which should be off or muted). One neednt unplug the AHT to make this connection, and you need only check the adjustment when you change the cartridge, arm or input cabling, or the load resistors. This is actually a very simple process that is thoroughly explained in the owners manual. Besides, in practice you wont need to do it very often, so dont let it scare you. Such a transparent and adroit performer is the AHT that perhaps it is easier to describe how the piece doesnt sound than it is to assign it any particular vestige of character. Dan Fanny is quick to point out that any piece of gear connected to this unit (including the interconnects) is likely to be more colored and therefore more of a limiting factor than the phonostage itself. He further postulates that if you hear any distortions, colorations, compressions, or lack of detail or extension, these symptoms are most likely caused by your associated gear. Certainly this is a bold assertion, but based upon my listening sessions with the Non-Signature, I found no evidence that would disprove it. Playing the first cut, Steve Winwoods "The Finer Things" from Back in the High Life (Island 9-25448-1), I got the shock of my audiophile life. I quite simply was not prepared to face the magnitude of the improvements wrought by the Non-Signature. My initial impression (which is usually the best indicator) was that the soundstage had expanded, both laterally and in depth, and that the instruments had a solidity and sense of wholeness that Id never heard in my system to this degree. While I breezed through other albums it became clear that certain high-frequency percussive instruments, such as castanets, various shakers, tambourines and bells, were presented as three-dimensional entities that appeared out of nowhere in a vast multi-layered soundscape. These instruments along with cymbals, triangles and others, oozed with timbral flavors that were natural and proportionately correct. A wealth of detail and texture were there to be savored without the undue emphasis (i.e. non-linearities) that can be the bane of lesser phono sections. It quickly became clear that I was hearing a much greater range of dynamic contrasts. Instruments seemed to spring forth with startling life and vibrancy. All the subtle gradations between pianissimo and fortissimo were served up with poisea veritable feast for the hungry listener. Orchestral crescendos were rife with explosive sforzandos, but perhaps even more impressive is the Non-Signatures ability to portray endless gradations of microdynamics. It brought out a level of nuance and expressiveness on many cuts that is unsurpassed in my experience. Listening to Karla Bonoffs tender plea on "Falling Star," from Karla Bonoff (Columbia JC 34672), accompanied by some soulful fret work on acoustic guitar by Bonoff and Kenny Edwards, was just so engagingly beautiful that it moved me to tears. Whats more, Ive never heard the strummed and plucked guitar strings on this cut sound more real and convincing, both tonally and in terms of their bite and clarity of outline. "Yeah, but hows the bass?," you query. Two words: structural damage. Playing pop tunes like "Pop Goes The World," by Men Without Hats (Mercury 888 859-1, 12" single), I was amazed at both the extension and control of the bass notes in the opening run. For a moment, I thought my world was going to "pop"or at the very least, that my speakers would. However, when I delved into my pile of classical heavies, thats when the bass of the Non-Signature really hit me. Lowering the stylus to the surface of "Danse Macabre," from Witches Brew (RCA LSC-2225), I was hearing some very low-frequency rumble (from that subway near Kingsway Hall, London) that was somehow more distinct and a touch more obvious than I can remember it being in the past. On crescendos, when the bass drum thundered, it thundered with authority. Weight, pitch and control were there in just the right proportions, and this was clearly evident cut after cut. It was as if the lower frequency limits of my speakers had suddenly been extended another half octave with less muddling and increased agility. Fannys measurements indicate that the Non-Signature is virtually ruler flat to DC, and although my speakers dont have much output below about 26Hz, the bass quality of my system was vastly improved. There were also greater perceived differences in the character of the lower octaves from recording to recording, which is indicative of improved resolution. Further up the scale, violinsboth solo and massedcame across with breathtaking realism. Spinning Classic Records reissue of Lalos Symphonie Espagnole (LSC-2456) soloist Henryk Szeryng gives a stirring performance against the backdrop of a full symphony orchestra. The interplay of Szeryngs instrument with the orchestra is quite beautiful and very masterfully recorded, with neither aspect losing focus or dominating the other. With the Non-Signature, all these crucial relationships are rendered splendidly, especially the natural sweetness of the soloists violin and the virtuosity of his playing. I mean, this guy hits some amazingly high notes with his chin-axe, and the AHT allowed them to remain consistent with the sound of the violin. Conversely, it didnt allow them to be transformed into the harsh, steely, wretched squawking so often presented by lesser electronics. The trumpet blasts on "Danse Macabre" from Witches Brew caused one of my harder-to-please audiophile friends to proclaim that this was first time he had ever heard the instrument sound "real" on an audio system, and I agree. The speed, timbre and jump factor the AHT elicits from the trumpet on this well-known cut truly must be heard to be believed. Here, the ring and bite of the brass is rendered in just the right proportions. Many classical buffs contend that the performance on this record leaves much to be desired, and be that as it may, I respectfully assert that the quality of the sound on my Classic Records reissue is most impressive. Through the Non-Signature, with its masterful soundstaging, natural timbres and bombastic dynamics, I fail to comprehend how one could hear this recording and not be moved. The only thing in my experience with this unit that could be remotely construed as a coloration was a mild highlighting in the upper midrange that tended to accent sounds such as the uppermost registers of piano and female soprano. This was only noticeable with certain recordings, and I cant entirely rule out the possibility that it may have been caused by something else in my system or the particular recordings themselves. The AHT Non-Signature phonostage is one of those rare pieces of gear that openly defies description. It is an extremely musical, non-limiting device that will allow its user to get the most from his or her associated gear and to be better able to assess and appreciate each successive change in the upgrade path. It provides a degree of neutrality and level of accuracy that will not only showcase the musical performance of any given recording but expose its miking technique, flaws, limitations and extemporal artifacts that are very often masked in competing designs. There are many fine phono sections that excel in certain parameters, usually to the neglect of others. In my experience with other high-end products, Ive encountered no singular piece that combines the myriad aspects of a musical performance to the degree the Non-Signature exhibited. Frankly, it would be difficult for me to fathom the idea that any unit could improve significantly on what designer Dan Fanny has accomplished here. Yes, there are some phono sections that can glamorize the sound with their seductive euphony, and still others that will have complimentary colorations that might provide a more synergistic match in certain installations. My feeling is that the more neutral your ancillary gear becomes, the better youll be able to appreciate the seemingly limitless virtues of the AHT Non-Signature. Case in point: Just when I thought it couldnt get any better, I received a new AC turntable motor-drive unit ($1,600) designed by Dan Fanny and ear-tweaked by The Sultan of Tweakdom himself, Mr. Lloyd (Proscenium Gold Signature turntable) Walker. [Note, this unit will be marketed under the Precision Motor Controls moniker, a joint venture between AHT and Walker Audio.] Guess whatthe sound got better. Presto, less apparent surface/background noise, a more refined and airy treble and an even tighter bottom end were immediately noticeable. Pinpoint focus and resolution of infinitesimal details, formerly buried in the noise floor, were nonchalantly exposed. Id have almost sworn I could differentiate between different grades of vinyl on a molecular level. When I switched to the less expensive AHT-P phono section, the differences between the Walker motor-drive and the ByLux filter Id been using became much less pronounced. Accordingly, it is with utter confidence that I give my highest recommendation to the AHT Non-Signature phonostage, an exceptional product that even at its price of $5,750 must be considered a stone-cold bargain.